We’ve become a world of instant information. We carry mobile devices that answer questions in seconds and we track our morning runs from screens on our wrists. News spreads immediately across our social feeds, and traffic alerts direct us away from road closures. As consumers, we have come to expect answers now, in real time. Until recently, businesses that were seeking information about their customers, products, or applications, in real time, were challenged to do so. Streaming data, such as website clickstreams, application logs, and IoT device telemetry, could be ingested but not analyzed in real time for any kind of immediate action. For years, analytics were understood to be a snapshot of the past, but never a window into the present. Reports could show us yesterday’s sales figures, but not what customers are buying right now. Then, along came the cloud. 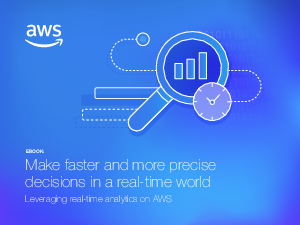 With the emergence of cloud computing, and new technologies leveraging its inherent scalability and agility, streaming data can now be processed in memory, and more significantly, analyzed as it arrives, in real time. Millions to hundreds of millions of events (such as video streams or application alerts) can be collected and analyzed per hour to deliver insights that can be acted upon in an instant. From financial services to manufacturing, this revolutionary approach to analytics is accelerating decision-making and helping businesses gain a competitive advantage in their industries.